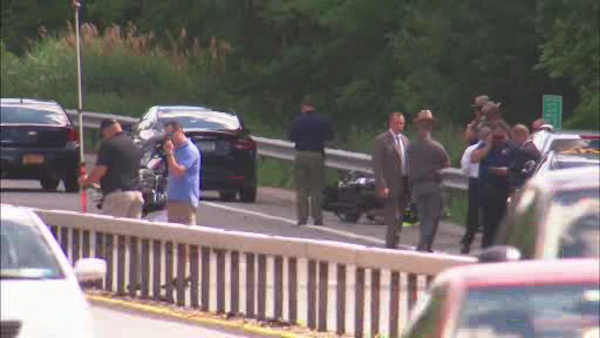 PUTNAM VALLEY, New York (WABC) -- A serious accident involving a group of police motorcycles left one officer seriously hurt and closed down a stretch of the Taconic Parkway in Putnam County Wednesday. Both southbound lanes were closed near Bryant Pond Road in Putnam Valley. Investigators say at about 1:50 p.m. a group of police motorcycles engaged in a training run were traveling in the southbound lanes at the interchange with Bryant Pond Road. At about that time, another vehicle began to merge from Bryant Pond Road onto the Taconic. As the vehicle attempted to merge, several of the motorcycles were forced to take evasive action, and two of the cycles struck each other, according to police. One of the operators, a West Haven police officer, was ejected from his bike and suffered serious injuries. He was transported by LifeNet Medevac to Westchester Medical Center. The second rider, as well as the other motorist were uninjured.